A pioneering breathalyzer has been designed to collect exhaled breath samples with potential biomarker volatile organic compounds (VOCs) that could be associated with inflammatory diseases, infectious diseases, cancer, and potentially certain types of cancer [1–5]. After collection, samples are analyzed through heat desorbtion, Gas Chromatography, and Field Asymmetric Ion Mobility Spectrometry (FAIMS) next generation detection microchip technology for established biomarker VOCs, or Mass Spectrometry for biomarker VOC discovery. These sophisticated collection and analysis techniques forge Owlstone Medical Breath Biopsy® platform . This relatively small -in size- breathalyzer is aiming to achieve a monumental mission; saving 100,000 lives and $1.5 billion in healthcare costs. Marc van der Schee, Head of Clinical, at Owlstone Medical, describes VOCs in the terms “..a wealth of valuable information about the health of an individual. Over 1,000 VOCs in breath have already been identified” . In 2017, the World Health Organization, released Guide to cancer early diagnosis , ahead of World Cancer Day (February 4); outlining three key steps to save lives through early cancer detection: (I) enhance public awareness of different cancer symptoms and persuade the lay public to seek care when symptoms arise, (II) invest in equipping the health services and training health personnel to conduct accurate and timely diagnostics, and (III) ensure cancer patients can access safe and effective treatments without financial hardship. Low- and-middle-income countries are at further disadvantage of succeeding in implementing these steps; given the limited access to and availability of cancer detection, diagnostic, and treatment tools. In 2014, cancer treatments cost US patients nearly $4 billion out-of-pocket . Moreover, such cancer treatments occupied a significant proportion of the total US health care spending bill; with costs mounting to nearly $87.8 billion, spent on cancer-related health care . From 2010 through 2015, cancer services cost the National Health Services (NHS) roughly £5 billion annually, but if the cost to society as a whole – including costs related to loss of productivity – are taken into consideration, as they should be, the costs inflate to nearly £18.3 billion annually . In 2011, the UK government published Improving Outcomes: a strategy for cancer ; investing a budget of £750 million over 5 years to ensure early cancer diagnosis, and facilitate access to cancer testing and treatment. Early cancer detection, evidently, remains a health and financial priority worldwide. Early and lower-cost cancer detection is the first major area Owlstone Medical’s Breath Biopsy (BB) platform is tapping into and is vowing to benefit. ReCIVA® Breath Sampler is non-invasive, pain-free, has a relatively lower-cost compared to other cancer detection methods, takes 1 minute to collect exhaled breath with known biomarker VOCs or 10 minutes for biomarker VOC discovery, is a reproducible conduit for breath collection, and can be used anywhere not just in the hospital. Owlstone’s FAIMS technology provides rapid, sensitive and selective VOC analysis. Such analysis can be conducted in a central lab or –on the long-term- at point of care. In the USA, costs pertaining to the management of adverse drug reactions (ADRs) go up to nearly $30.1 billion annually . In the UK, definitely avoidable ADRs cost the NHS roughly £98.5 million annually; occupying 181,626 bed days, and contributing to 1708 deaths during the index hospitalization . These high costs are attributed to increased hospitalization (primary care ADRs), or prolongation of hospital stay and the need for more clinical investigations in serious cases (secondary care ADRs). Adverse drug reactions, evidently, remain a health and financial dilemma worldwide. Avoiding ADRs upon drug administration –or precision drug administration- with a lower-cost approach is the second major area Owlstone Medical’s BB technology is tapping into and is vowing to benefit. Chris Claxton, Head of Investor Relations, at Owlstone Medical, shared with us that exogenous VOCs (EVOCs) can be used to assess in vivo metabolic function using EVOC probes. Claxton expanded that through measuring the kinetics of a mix of EVOC probe substrates and metabolites, a metabolizer phenotype can be generated. Changes in metaboliser phenotype can lead to drug toxicity or inefficacy. This is currently under development, and will be launched initially for research applications. 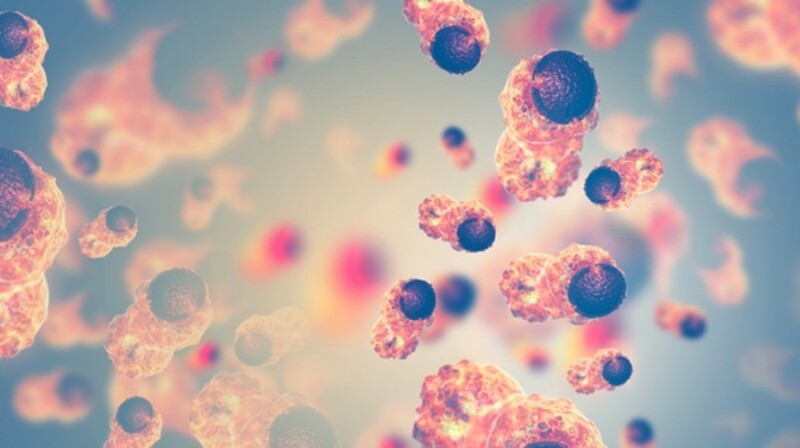 Owlstone Medical launched the PAN Cancer trial for Early Detection of Cancer in Breath (ClinicalTrials.gov Identifier: NCT03756597)  in collaboration with researchers from Cancer Research UK (London, UK), and the University of Cambridge and Cambridge University Hospitals NHS Foundation Trust (Cambridge, UK). This 1500-patient, six-cancer-targeted trial, is recruiting patients at Addenbrooke’s Hospital in Cambridge with suspected esophageal and gastric cancers. Over time, prostate, renal, bladder, liver and pancreatic cancer patients will be recruited. These cancer patients will represent the trial’s cases, whereas, recruited healthy individuals will represent their matched controls for gender, age, and tumor-specific risk factors. The trial’s primary outcome is to detect cancer biomarker VOCs, which are linked to the early-stages of these six cancers (see figure 1), and discriminate biomarker VOCs between these six cancers, if possible. Secondary outcomes include patients’ feedback on ReCIVA®’s usability and accessibility. Other outcomes include the influence of the tumor’s primary location and its phenotype on VOC profiling. Thrilling as this technology may be, several questions remain in store: will this breathalyzer be affected by other confounding variables; such as the difference in patient characteristics (i.e. obese versus normal weight patients, or patients taking certain drugs affecting their metabolism versus those who are not)? Will the difference in patient treatment modalities, which subsequently affect cancer metabolism for the same cancer, possibly produce divergent signature VOC profiling (i.e. chemotherapy versus immunotherapy for colon cancer)? And will the difference in patients’ respective environments play a role? Rebecca Fitzgerald at Cambridge University, lead PAN cancer trial investigator, spoke to us on these issues, and elaborated: “almost certainly [the answer to your first question], which is why we are including a large number of controls, both those being referred for a suspected cancer, but who turn out not to have cancer and are completely healthy volunteers.” “We are collecting the samples prior to therapy” answering your second question. “We are sampling fairly large numbers of cases and controls, and also trying to standardize the collections [such as using the] same consulting room, [at] random time of the day (not the same time for controls and different time for cases, etc)” answering your third question. Breath biopsy has the potential to serve as a triage or referral tool for patients with early-stage cancer, who are asymptomatic or display non-specific symptoms. Patients can be referred from primary care into specialized care. Specialists can, subsequently, implement more advanced testing (e.g. tissue biopsy) to further investigate their disease including cancer. In addition, VOCs measurement and analysis has the potential to serve as an effective cancer recurrence monitoring tool. Markar and colleagues  conducted a study, whereby the results of the VOCs in breath, were shown to be a biomarker of colorectal cancer recurrence after surgery. Standardization of breath collection and analysis is a first vital step to widely incorporate the breath test into clinical practice. Breath tests can be influenced by methodology of breath collection, test environment, and patients’ physiologic condition. In 2005, the American Thoracic Society and European Respiratory Society published international recommendations for standardizing nitric oxide measurement . This spurred its adoption as a diagnostic tool. Standardizing the instruments used for the exhaled breath test represents a second vital step. Such instruments should be tested and optimized to become reliable in reproducing the VOCs results. Separating patients with different tumor subtypes, tumor stages, histologic and molecular subtypes, from controls according to established test thresholds is a third vital step before instigating masked validations. Accurate clinical reporting based on established guidelines (e.g. Standards for Reporting of Diagnostic Accuracy Studies (STARD)  and CONSORT  is a fourth vital step. Establishing large, multicenter clinical studies with appropriate patient populations, and external validations against positive controls, is a fifth vital step. 1 Arasaradnam RP, McFarlane MJ, Ryan-Fisher. et al. Detection of colorectal cancer (CRC) by urinary volatile organic compound analysis. PLoS One 9(9), e108750 (2014). 5 Owlstone Ltd, Cambridge University Hospitals NHS Foundation Trust & Cancer Research UK. PAN-study: Pan-Cancer Early Detection Study (PAN) https://clinicaltrials.gov/ct2/show/NCT03756597, (2018). 6 Owlstone Medical Ltd. Owlstone Medical’s Breath Biopsy® Platform https://www.owlstonemedical.com/science-technology/breath-biopsy/, (2019). 7 van der Schee M, Pinheiro H, & Gaude E. Breath biopsy for early detection and precision medicine in cancer. Ecancermedicalscience 12, ed84 (2018). 8 WHO. Guide to cancer early diagnosis <https://apps.who.int/iris/bitstream/handle/10665/254500/9789241511940-eng.pdf;jsessionid=4BEC54447715A45A8F035BCC110C119C?sequence=1> (2017). 9 Cancer Action Network American Cancer Society. The costs of cancer: addressing patient costs, <https://www.fightcancer.org/sites/default/files/Costs%20of%20Cancer%20-%20Final%20Web.pdf> (2017). 10 UK Government Department of of Health and Social Care. 2010 to 2015 government policy: cancer research and treatment, <https://www.gov.uk/government/publications/2010-to-2015-government-policy-cancer-research-and-treatment/2010-to-2015-government-policy-cancer-research-and-treatment> (2015). 11 UK Government Department of of Health and Social Care. Improving Outcomes: a strategy for cancer, <https://www.gov.uk/government/publications/the-national-cancer-strategy> (2011). 12 Sultana J, Cutroneo P, & Trifiro G. Clinical and economic burden of adverse drug reactions. J. Pharmacol. Pharmacother. 4, S73-77 (2013). 13 Policy Research Unit in Economic Evaluation of Health & Care Interventions (EEPRU). PREVALENCE AND ECONOMIC BURDEN OF MEDICATION ERRORS IN THE NHS IN ENGLAND, <http://www.eepru.org.uk/wp-content/uploads/2018/02/eepru-report-medication-error-feb-2018.pdf> (2018). 14 Markar SR1, Chin ST, Romano A, et al. Breath volatile organic compound profiling of colorectal cancer using selected ion flow-tube mass spectrometry. Ann. Surg. doi:10.1097/SLA.0000000000002539 (2017)(Epub ahead of print). 15 American Thoracic S, & European Respiratory, S. ATS/ERS recommendations for standardized procedures for the online and offline measurement of exhaled lower respiratory nitric oxide and nasal nitric oxide, 2005. Am. J. Respir Crit. Care Med. 171, 912-930 (2005). 16 Cohen JF, Korevaar DA, Altman DG et al. STARD 2015 guidelines for reporting diagnostic accuracy studies: explanation and elaboration. BMJ Open 6, e012799 (2016). 17 CONSORT TRANSPARENT REPORTING of TRIALS. CONSORT 2010 Statement: updated guidelines for reporting parallel group randomised trials, <http://www.consort-statement.org/> (2010). Hanna GB, Boshier PR, Markar SR, et al. Accuracy and Methodologic Challenges of Volatile Organic Compound–Based Exhaled Breath Tests for Cancer Diagnosis. JAMA Oncol. doi: 10.1001/jamaoncol.2018.2815 (2018)(Epub ahead of print). de Lacy Costello B, Amann A, Al-Kateb H, et al. A review of the volatiles from the healthy human body. J Breath Res 2014; 8(1):014001. (2014). Queralto, N. et al. 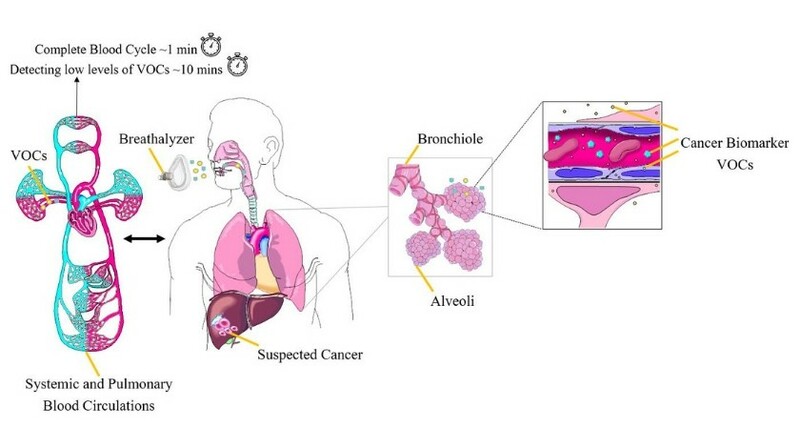 Detecting cancer by breath volatile organic compound analysis: a review of array-based sensors. J. Breath Res.